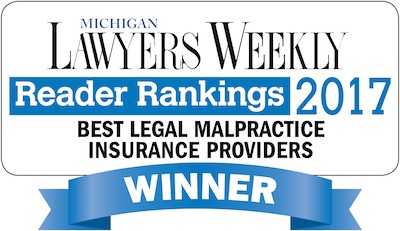 Michigan lawyers now have access to new premium credits to reduce the cost of malpractice insurance. Institute of Continuing Legal Education (ICLE) customers and contributors who are CNA Lawyers' Professional Liability (LPL) policyholders are now eligible for premium cost reductions of up to 25%* every year! In September 2018, ICLE aligned with CNA and Paragon to provide a variety of risk management premium credits to reduce the cost of LPL coverage. How Much Can You Save with ICLE and CNA? 1. Be an ICLE Partner – ICLE Partners save up to 7%. The longer you’re a Partner, the more you save. 2. Complete an ICLE Certificate – choose an entire practice area or a specific topic and save up to 7%. 3. Attend a Major ICLE Conference – annually attend any of ICLE's major Institutes and save up to 2%. 4. Be an ICLE Volunteer Contributor – join hundreds of your colleagues and help us with a seminar, book, or other online resource to save up to 7%. 5. CNA Risk Control Participation – ICLE Partners who also participate in CNA specific risk management initiatives can save an additional 2%. Paragon will facilitate the placement of coverage with CNA for attorneys who qualify for ICLE premium savings and assist those who don’t qualify with alternate Professional Liability coverage options. Paragon provides tailored solutions for firms of all sizes, complexities and area of practice concentrations. *Potential savings are determined by the specific attorney and his or her practice. Savings can only be obtained by providing a current insurance savings eligibility report found in the ICLE My Account area at www.icle.org. How many attorneys at your firm? Additional comments, questions or requests?